What is the best time to Stain a Deck? 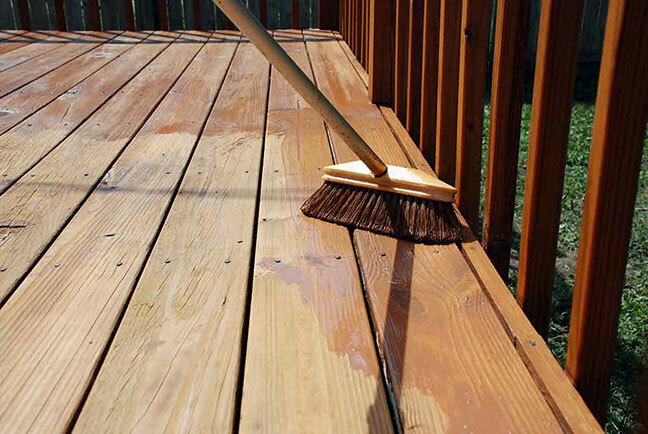 Spring and fall are the most popular times to stain your deck, and rightfully so. Avoiding the hot summer temperatures increases your chance for success with your project, as the hot summer sun can cause stain to dry too quickly, thus, not allowing it to fully penetrate in to the wood and often times resulting in peeling. When staining in the spring, the boards can be damp from the winter weather. If they are, using an oil-based stain can be a problem…oil and water don’t mix! Using a water-based material is always a much better choice until the deck has thoroughly dried out. Hot sun can cause problems. It can dry the stain out too quickly, not allowing enough time for it to penetrate in to the wood. Direct sunlight can also increase the surface temperature of the boards. Try walking on it barefoot…if the wood is too hot to walk on, then it is too hot to stain. Try staining during the cooler parts of the day, morning and evening, any shade is always good for the project. This can be pretty important, especially for oil-based stains. It will normally take 2-3 days for a deck to dry out after a rain and if you’re using an oil-based stain, it must be dry. If in doubt, choose a water-based product as those can generally be applied as soon as the deck becomes visibly dry again. This can be pretty important, especially if you are using an oil-based product. Water-based materials, like Defy Wood Stain ( www.defywoodstain.com), Restore-A-Deck ( www.restoreadeck.com ) and #1 Deck Stain ( www.1deckstain.com ) will dry in as little time as an hour or two but some oil-based materials might need 2-3 days to dry out before they will be resistant to the rain. If in doubt, consider avoiding the oil-based products.